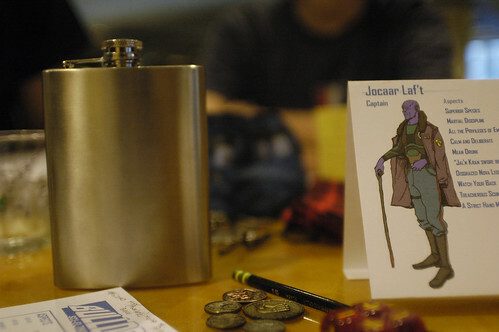 So, I went to GenCon, where I may have married Jason Morningstar under an assumed name. When I got married to my husband, Jared Axelrod, it was a non-denominational ceremony, that made no reference to any deity. We were married by a friend. When I got married to Jason Morningstar (under an assumed name during a roleplaying game) it was by an actual Preacher. By chance, I was cast as Regina, and Jason took on the role of Sanchez, her fiancee. Near the end of the game, we played out the ceremony, and the Preacher at the table played the preacher. And married us. Now I’m wondering – what if I’m wrong? I’m not relgious, but if I’m wrong about that, and the Christians are right, God’s paperwork is going to be all messed up. I imagine myself at the pearly gates being told the story of my life and my many enjoyable sins and being informed of my marriage to Jason MorningStar. “Wait – I think that’s a clerical error.” I’d say. Fiasco is a very fun game. I played it three times at GenCon, and each time it was hilarious and fun. One thing I like about it is the way characters to terrible things to themselves and each other, making stupid, cruel and selfish choices and how those choices join to make an incredibly entertaining story. It can be a paradigm shift for players who are used to defending their characters and trying to think of the best and smartest choices to make, to turn around and start thinking about what the most entertaining choice would be, to think of themselves not as their characters advocate for personal safety, but as the characters advocate for a good story. I played Do with Daniel Solis, which was great fun, and charming as all get out. Lots of people talk about how beautiful the book is, because it is beautiful and that’s the first thing that strikes you when you pick it up, that the art is beautiful, that it is beautifully laid out, that it is charming and elegantly displayed. What isn’t as often mentioned, but what bears mentioning, is that along with being beautiful, it is also very well written. It is a smooth and easy read. Describing how to play a game in a way that is fun to read isn’t always easy, but Daniel makes it seem so. I made a character for Ameranthine, the game by David Hill Jr and Filamena Young, and, as always, character creation is a blast. The concept of having past lives that tie you into a gaming group and create attachments and problems and conflict and love interests is just great fun. I also played Bulldogs. Playing Bulldogs is like getting tied to a chair and thrown off a cliff, but with a team of miscreants who may or may not save your life. I played Bulldogs at DexCon near the waterfall – if you’ve been, then you know what I’m talking about. In that first game, I used the phrase “Space-Crystal” as a term of endearment, which I later had to reveal that I stole from comedian, Mike Birbiglia, but which, a the time, made me appear rather clever. If I ever make a very clever quip at a party, chances are that I have heard some talented performer say it first and I am aping them.That is the gift comedians give us – the ability to use their jokes at cocktail parties (or, if you are me, role-playing games) and appear quite clever. 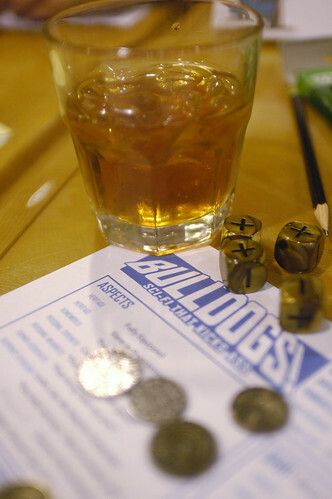 At GenCon, I wasn’t able to play Bulldogs until after the con itself had closed, when I sat down in a hotel room with some new friends to play the game. Brennan Taylor ran the adventure, and both he and the players conspired to make it very entertaining. Playing a game that’s run by the creator is something very special. The creator understands the game, has passion for the game, and runs the game with fluidity and charm. On of the players was Brennans’ son. I just got to know Brennan’s son on this trip, and he is now the only teenager of my acquaintance. If he represents what is to come, then we are all in for a bright and amazing future. Also, we talked endlessly about Ponies, because we are Bronies, and if you don’t know what that is, that’s okay. 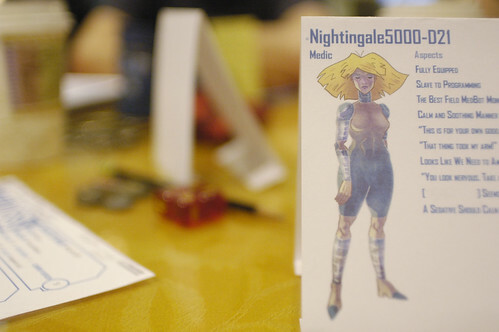 I played Nightingale 5000 – the best medbot that money can buy. Her programming insists that she must protect the crew from harm. However, her programming is also, shall we say – rather short-term? So when the crew started to violently fight amongst themselves, she ran from the room, waving her robotic arms, and then flooded the ship with sedative. Then, because no one was piloting the ship, it crashed. 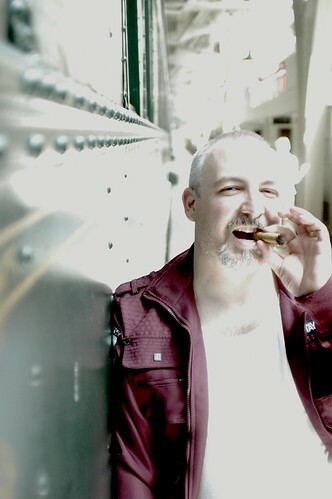 Brennan, seen here in his TransGalaxy Captain uniform, is the owner of Galileo Games, which is putting out Bulldogs, Kingdom of Nothing, Mortal Coil and other great games. He is also publishing my game, Shelter In Place. We are planning a kickstarter in September, and, if all goes well, a full release in October. This GenCon, Brennan was my guide, introducing me to amazing people in the community, giving me pointers, and being my Captain in this brave new world of GenCon. I could have gone on my own, but I would have been an outsider, stepping into a world unannounced. But I came with a Captain and a friend, and that is always better. *My theology might be shaky.